Explore More Discovery Museum recently reached an exciting milestone. We are officially 15 years old! Since day one, Jim Henderson and his family have been ambassadors for the Museum, giving their collective time, talent and treasure. Since it first opened in 2003, Explore More (then Harrisonburg Children’s Museum) has been important to our family. I have served on the Board of Directors, including a term as President, and as a long-time member of the Building Committee where I’ve had the opportunity to help the museum through many phases of growth. My wife Amy, our sons James and Nathan, and my parents Charlie and Mary Henderson have watched this community-driven project grow into a first-class regional destination for families, a centerpiece of downtown revitalization and an economic driver for the area. Amy has been a huge contributor to the museum over the years. She was with me at the first organizational meeting and helped launch our traveling museum the first summer. As a long-time educator in the Harrisonburg City Schools, she has used her expertise to create exhibits, teach summer camps, and currently serves on the program committee. James (age 17) and Nathan (age 15) literally grew up in the Museum. In fact, James was 6 months old and attended the first organizational meeting in a bucket seat. It is hard to believe that he’ll head off to college in the fall! When it was time for the Museum to try its first ever Jazz in June fundraising event, my parents, Charlie and Mary, stepped up to offer their home. They continue to support and attend all of the museum events. to support it financially. We know that our contributions will make a difference and have seen first-hand how far each dollar goes. Most importantly, we have seen how much this downtown destination has given to the community and to thousands of children and families throughout the region. We encourage you, as someone who cares about our children and our community, to give generously, volunteer eagerly, and truly experience Explore More Discovery Museum. 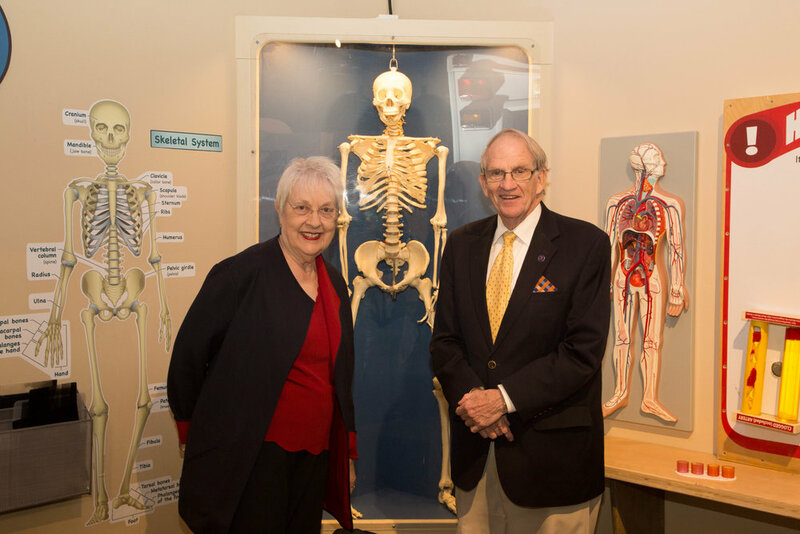 Charles, a retired physician, and wife Mary pose next to the skeleton, a staple of the museum for 15 years! Will YOU join the Henderson Family and make your tax-deductible gift today? Together, we can continue to offer a rich and fun learning environment for every child. Thank you for your continued support—we can’t wait to see where the next 15 years takes us!